This week is Climate Week in New York, when President Obama, Pope Francis, and many other world leaders converge to continue hammering out commitments intended to limit global warming to 2 degrees C or less, to be presented at the make-or-break COP21 climate meetings in Paris in early December. The commitments are not there yet--so far those on the table would allow enough greenhouse gas emissions to raise temperature 3 degrees C or more. But staying below 2 degrees is critically important, for we already are seeing climate-triggered problems arise, even though global temperature has only risen less than one degree (0.9 degree C) above what used to be normal, and indeed what human civilization evolved in. Equally dramatic climate-caused tipping points are what many credible studies predict within the next human lifetime: like rising sea levels displacing hundreds of millions of people, mass extinction of familiar plants and animals, and catastrophic floods and droughts. There may be some comfort in knowing these dire predictions are for the future (albeit the near future), and that there is still a chance to avoid the worst-case outcomes. 1. In California, where we live, three years of intense drought went virtually unnoticed in day-to-day lives, but now in the fourth year, we hit the tipping point as water reserves in the soil and plants have finally been exhausted. Seemingly overnight, hundred-year-old trees in our neighborhood began dying, and with them, the landscape we had taken for granted. 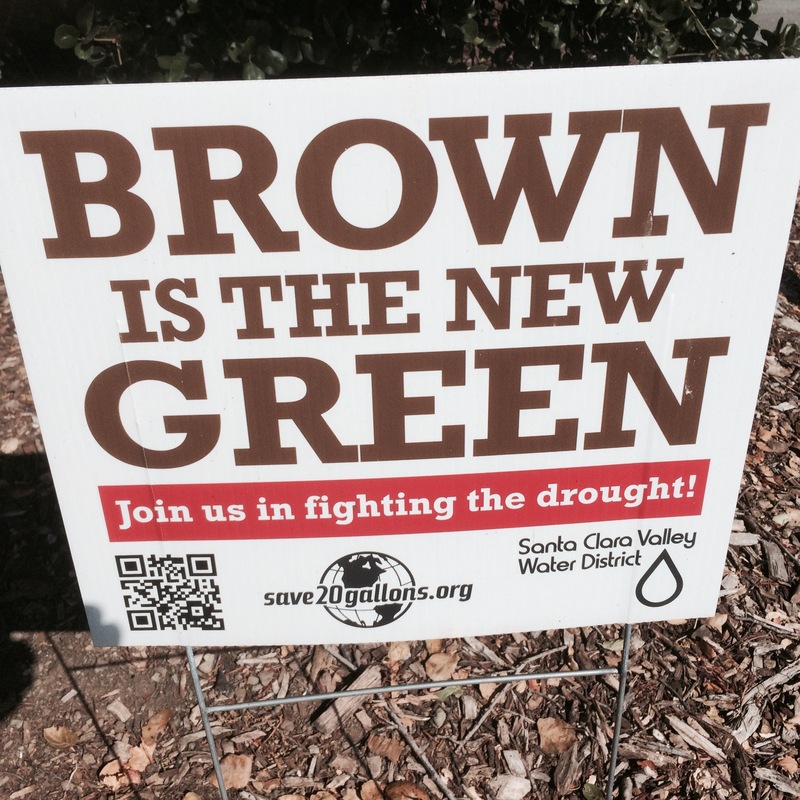 Throughout our state, lakes and streams have dried up, as have more than 2000 water wells. Reservoirs continue to empty and economic losses are now near three billion dollars. As tempting as it is to attribute the prolonged drought in our part of the world to natural climate variation, the science says otherwise. Higher than normal temperatures over the past few years are the result of global greenhouse gas emissions and have exacerbated arguably "normal" dry conditions by increasing evaporation and melting snow too early in the spring. 2. Heat waves worldwide are more common and more intense than they used to be. This year, unusual hot spells have killed thousands across India, Pakistan, Japan, China, Europe, the United States, much of South America, and Australia. This weird weather is just what robust climate models predict as an outcome of heating up the globe. Basically, more heat means more energy in the atmosphere, so weather gets more extreme. The new normal in weather extremes--hurricanes, tornadoes, and the like--can be measured in tax-payer dollars as well as in individual suffering: since 2008, there have been about twice as many billion-dollar weather catastrophes in the United States, compared to what was normal for previous time spans of similar length. 3. Vast ecosystems are changing before our eyes, through such processes as rampant wildfire and insect infestations. In the American West, record wildfires have eaten not only entire forests and many homes, but half the entire budget of the U.S. Forest Service--and firefighting costs are projected to consume two-thirds of the Forest Service budget within a decade. In California alone, there were about as many firefighters dispatched to battle wildfires as there were troops in Afghanistan. Record wildfires in the U.S. are part of a new global problem, reflecting a tipping point that first became apparent in North America in 1988. That year, western wildfires doubled in frequency, a result of forests that became tinder-dry from a few successive years of above-average temperatures. That new normal has remained ever since, and is part of a worldwide trend to more frequent, bigger wildfires. Last July in Canada, for instance, a new fire erupted every 50 minutes in British Columbia, and one of every 100 Saskatchewan residents were displaced by wildfires. 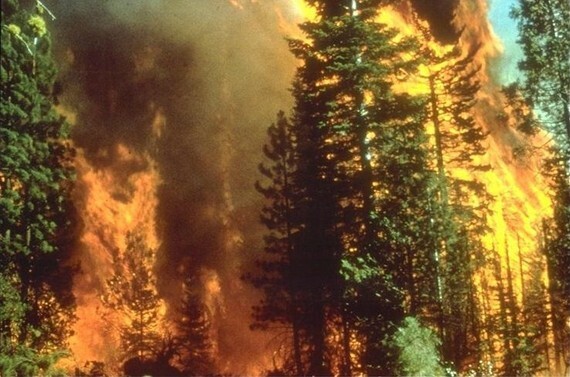 Globally, more than half of the world's vegetated surfaces now experience longer fire-weather seasons than they did in the last quarter of the 20th century. Besides inflicting uncountable personal losses and draining budgets of government agencies, the new fire regime has sent shockwaves through the insurance industry. Much of what hasn't been killed by fire has been killed by insect pests, which flourish in the warmer, drier conditions, and have chewed through millions of acres of formerly pristine forests. 4. The oceans too, are changing. Enormous masses of warm water have transformed northern coastal ecosystems, bringing novel tropical species to new shores and causing mass mortalities of native marine species. The unusually warm water is also promoting larger-than-normal, and more frequent blooms of toxic algae, so called red tides, that devastate fisheries and cause severe illness, even death, for people who eat the contaminated shellfish. 5. Even the ways we recreate are going fast. In the Swiss Alps, the Chilean Andes, and the Rocky Mountains, as well as in California, ski resort owners are resigned to the multi-billion-dollar losses the industry has seen over the past few years as snowfall not only decreased, but became less predictable and melted faster and earlier. Some owners are predicting that climate change will kill their business within 20 years. All of these examples, and many more, indicate that the changing climate has already tipped the world into a new normal, compared to what life was like when today's middle-aged adults were born. So far, we're coping, but not without great expense. While it is too late to go back from the climate-triggered tipping points we've already caused, it is not too late to avoid the more severe ones that threaten our near future. Just as solid science alerts us to impending dangers, it also maps out feasible paths to minimizing risks. In the case of climate change, the solution is quickly reducing greenhouse gas emissions to essentially zero, through replacing fossil fuels with clean energy. Studies indicate it is technically and economically feasible to replace coal, oil, and gas by 2050 with a combination of carbon-neutral approaches, including solar, wind, wave, and sustainable biofuel energy. That cannot be accomplished of course, without another kind of tipping point: a groundswell of popular support and political will to deal with the problem. If we do not cross that critical threshold soon, it will be too late. We are teetering on that brink of important societal change now, with even the presidents of the two countries that are the chief emitters of greenhouse gases--President Xi of China and President Obama of the USA--acknowledging that climate change is a serious problem and working towards solutions. And solutions are also emerging at the subnational level, with such initiatives as the Under2MOU and state-to-state and state-to-nation agreements that have been orchestrated by such politicians as California Governor Jerry Brown. 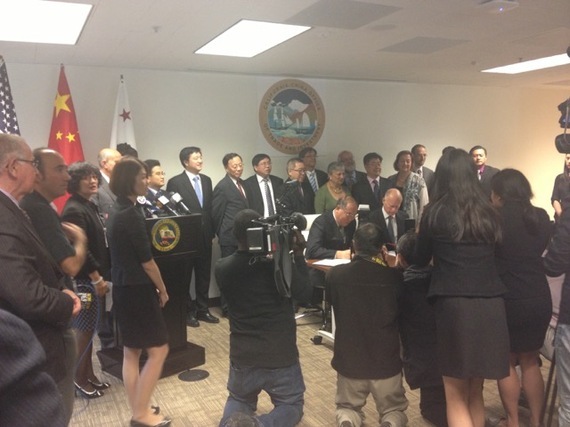 California Governor Jerry Brown and China's top climate official, National Development and Reform Commission (NDRC) Vice Chairman Xie Zhenhua, signing a first-of-its-kind agreement on climate change between the NDRC and a subnational entity. Pope Francis, too, has become outspoken about dealing with climate change, a position most of the world's major religions support. The sign that we tip into a future where, working together, we limit climate disruption to levels we can cope with will be commitments by the countries of the world to hold global warming to 2 degrees. If that does not happen in New York and Paris this year, the climate-triggered tipping points we've seen so far, already devastating, will look mild compared to those we'll see within the lifetime of young people today. Barnosky and Hadly are professors of biology at the University of California at Berkeley and Stanford University, respectively, and authors of the new book: End Game, Tipping Point for Planet Earth? (2015, HarperCollins / WilliamCollins, London. ), which will be published in the United States in April under the title Tipping Point for Planet Earth: How Close Are We To The Edge? (Thomas Dunne / St. Martin's Press, New York).